The planning for this trip started as soon as we left Florida in January 2013. Michael and I both bought an annual non-resident licenses (saltwater + freshwater) so we had the opportunity to fish Florida again in December 2013 to maximize the use of our licenses. 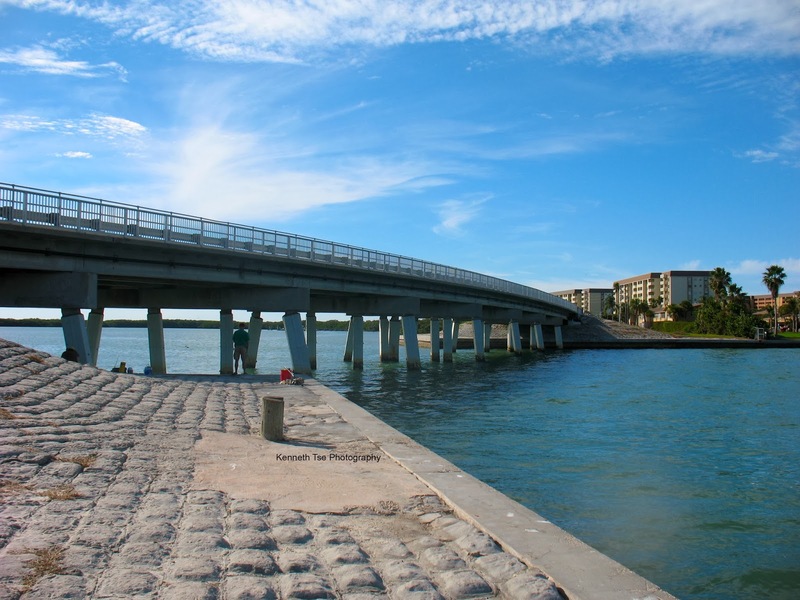 Sometime in the summer, we roped in Ben and his girlfriend Ruoxi to join our adventure for a week, and later Miciah also jumped onto our itinerary in the Keys. With 4 serious species hunter in the mix, this would be a wild ride! We left Toronto on the night of Wednesday December 11. As we crossed the US border, our patrol personnel interrogated us pretty harshly. He wanted to see our trunk...but he just waved us through after taking just one look. I didn't think he wanted to tear this apart at 11pm. Thank God he didn't find the 10lbs of frozen mackerel and sardines we brought to Florida to use as bait! We arrived in Florida on Friday December 13, 2013. Thanks to a hot tip from Ryan (who you will be introduced later), we were hoping to arrive in Tampa area to fish one of the spot that had recently produced Spanish Mackerel. Timing is of the essence since falling water temperature could quickly push these fish out of the area into more southerly water. Ryan mentioned that there were a lot of Planehead Filefish around the pilings in the area. Spottail Pinfish were also abundant. Using #14 sabiki rig with squid tentacle, I quickly added the first 2 new species on this trip! 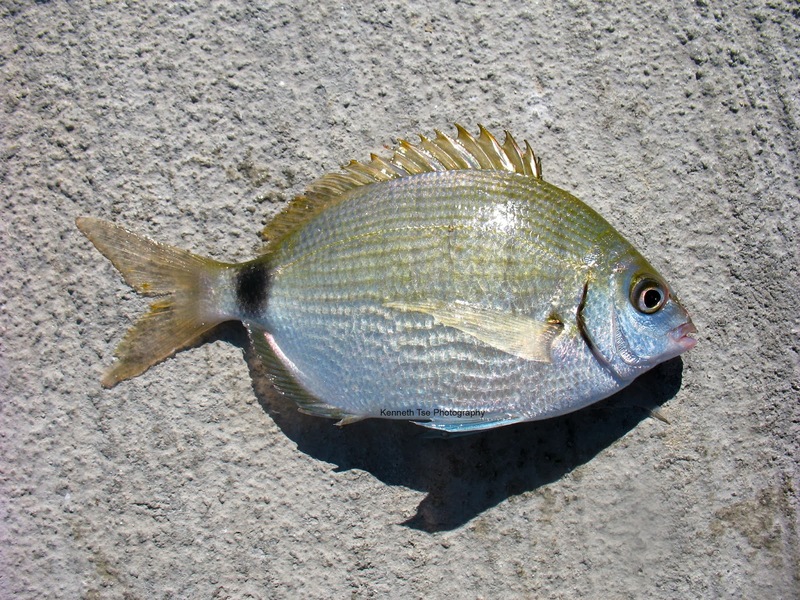 Now...there is a related species called the Silver Porgy that looks pretty much exactly like the Spottail Pinfish. I still don't know exactly how to tell them apart. 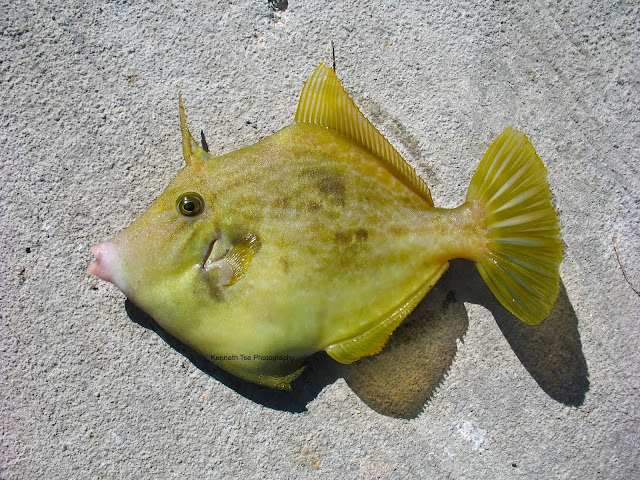 But for all intents and purposes, I'll just consider this one a Spottail Pinfish. I also caught an unexpected new species on the sabiki, the Silver Jenny...although this picture was pretty poor with a water smudge on the lens. I would catch more of them later in the Keys and there will be a better picture. While I was adding these lifers, people on the other side of the channel caught a couple of Spanish Mackerel. Michael went with a spoon while I tied on a Gotcha...and got ripped on the FIRST CAST! I've been trying to catch a Spanish Mackerel for 4 years whenever I fished in the Central Western Atlantic areas. I've had fish hit twice but missed the hook. I've missed the run by just one day or even just a couple of hours. It felt terrific to finally land one! After hitting all our targets within the short 2 hour stop, we were ready to hit our evening spot. But before we can get fishing, we needed some PVC rod holders...and so we were cutting PVC at a Home Depot parking lot in Florida LOL. We got to our evening spot just after dark. We were fishing the outflow of one of the many power plants in the Tampa area. Apparently, sharks are attracted to the warm water discharge as water temperature drops in the winter. This year, the water had remained warm so we were quite anxious about the potential of our location. But that was really the least of our worries. 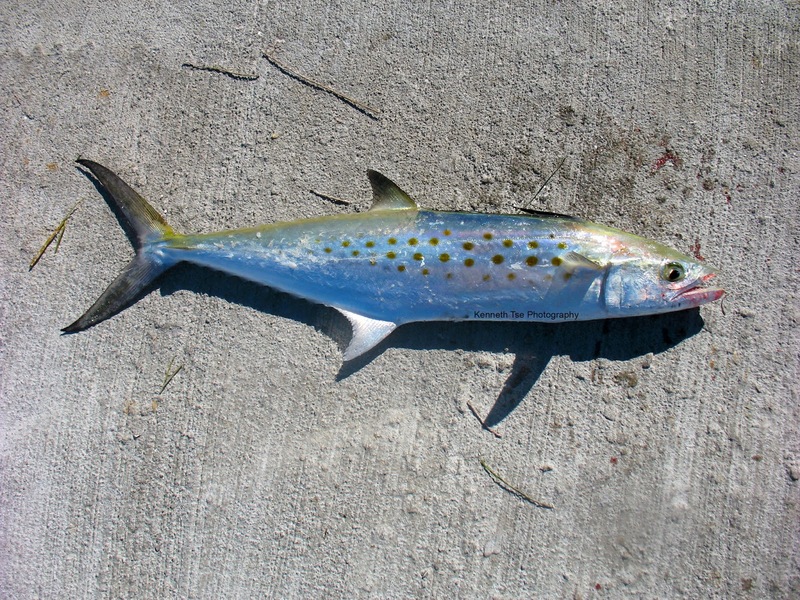 We kept the two Spanish Mackerel for bait since they were one of the best shark bait in the area. Unfortunately, we were being robbed by crabs all night whenever we tried to place a bait on the bottom. Finally, we started deploying baits on balloon rigs. The wind and current was in our favour, but it was still a lot drift off the beach to place the bait into deeper waters. While we waited, we were treated to a glorious Geminid meteor shower! I must have spotted a dozen Geminids that night. They were very bright, but unfortunately the sparse showing created a real challenge to photograph them. I know from experience that it would be a waste of memory and battery power shooting without a bulb feature on my camera. Michael finally had a run at around 12am. We were disappointed to see a baby Blacktip Shark snagged outside of the lower jaw. The hook was far enough from the mouth to question whether it was legit. Michael decided not to count it. An hour later, my bait was picked up and had a good run until the fish dropped it. We kept out bait fresh and kept sending bait out but by 3am, the lack of action made us realized we had been on the road since 7am the morning prior and we had no sleep since. We set up the tent for a quick nap and hoped to find something more promising in the morning.